Eight thousand children in the Montreal and Laval area currently suffer from chronic pain. Unexplained chronic pain--that is, pain with symptoms that are not due to significant injury or disease--is commonly referred to as non-specific, idiopathic, or functional pain. The most prevalent functional pain syndromes in children are growing pains, non-migraine headaches, and recurrent abdominal pain. Children and adolescents are also at risk of migraine, neck and back pains, chronic widespread pain, and its subset fibromyalgia. Since there is often no diagnosis, children can end up seeing several specialists, be given unnecessary medications that can have adverse effects, and miss school before they are treated for chronic pain. 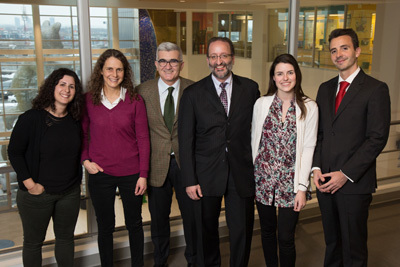 Dr. Pablo Ingelmo, Director of the Chronic Pain Service at the Montreal Children’s Hospital (MCH), joined the MCH in 2013 for his specialization in pediatric chronic pain. “Three out of four children with chronic pain will grow up to be adults with chronic pain, but that ratio drops to one in three when they receive proper treatment,” he says. 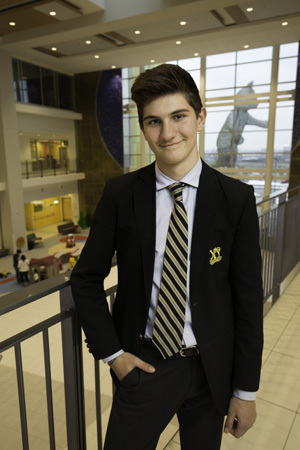 In March 2015 at the age of 12, Lorenzo Accurso was experiencing severe abdominal pain. The source of the pain was thought to be appendicitis among other possibilities, but no definitive diagnosis could be made. Once all the possible causes had been explored, Dr. Ingelmo and the Chronic Pain Service team took Lorenzo into their care. “Lorenzo had Functional Abdominal Pain Syndrome (FAPS), which is a diagnosis by exclusion,” says Dr. Ingelmo. FAPS is a visceral pain that is sometimes unexplained, but if there has been repeated injury in the abdomen, nerve receptors can become overly sensitive and a painful experience can be experienced as more painful than before (even the normal digestive process can come to be perceived as painful). The Chronic Pain team applied different medical approaches during Lorenzo’s first, week-long hospital stay. Unfortunately, the medical treatment did not work and a month later, Lorenzo found himself readmitted for six weeks. “The pain was unbearable and because of it, he was exhausted,” explains Alessandra Marani, Lorenzo’s mom. “Lorenzo was put on a lot of medication, but nothing seemed to work and at a certain point he had had enough,” she says. During the worst periods, Lorenzo would get four to five attacks per day and because he could sense they were coming, he would become stressed and start to panic. It was so taxing on Alessandra to see her son in such a state that she would have to step out of his hospital room during the attacks. “Chronic pain doesn’t only affect the patient, it necessarily affects the whole family too,” adds Dr. Ingelmo. Lorenzo admits that at first he was skeptical about the proposed exercise. “But at that point I had to give it a try,” he says. Dr. Beaulieu showed Lorenzo breathing techniques to deal with the bursts of pain. “Before this, I would pace back and forth when I experienced the pain, which made it worse,” he says. “Dr. Beaulieu told me to imagine myself in a place that I enjoy and focus on how it made me feel.” Although it took a lot of practice, the exercise eventually helped distract him from the pain. Understandably, after weeks in the hospital, Lorenzo just wanted to go home, and even though he was getting better at using the techniques to deal with the panic and pain, he would not be discharged until he felt no pain at all. “Now, I am perfect!” says Lorenzo matter-of-factly. He is in secondary three and plays football and rugby and does winter fitness at his school. “I was eager to stop taking the medication but Dr. Ingelmo asked me to continue, so I slowly decreased the dosage and eventually stopped going to the clinic altogether.” Considering that taking a walk used to be a challenge for Lorenzo, he has come a long way.